^ "Table 1. First, Second, and Total Responses to the Ancestry Question by Detailed Ancestry Code: 2000". U.S. Census Bureau. Retrieved 2010-12-02. ^ "CITIZENSHIP STATUS IN THE UNITED STATES: Total population in the United States. 2006-2010 American Community Survey Selected Population Tables". U.S. Census Bureau. Retrieved 2013-12-06. ^ a b Deena Yellin (2015-05-03). "Palestinian flag-raising is highlight of heritage week in Paterson". North Jersey Media Group. Retrieved 2015-05-04. 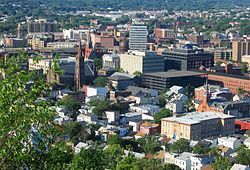 ^ "Paterson school district restarts Arab language program for city youths". Paterson Press, North Jersey Media Group. 2014-12-10. Retrieved 2014-12-10. ^ Andrew Wyrich (2016-04-17). "Hundreds in Clifton cheer raising of Palestinian flag". North Jersey Media Group. Retrieved 2016-04-17.